I have a credo: Just say NO to mystery boxes. Mystery boxes are offered by several subscription services, and tend to be a way to get rid of overstock items. So it seems like you are getting clearance stuff that basically no one else wanted. It is at a discount, but if you are a fan of the companies already, you probably have a lot of their products and might get duplicates. Yes, the piece in the bottom right is broken! I actually broke it; it didn't arrive that way. However, it broke because it looked like a metal cuff, so I tried to adjust it to fit my wrist, and instead it just cracked right in half. It's actually made out of some kind of plastic or composite material. 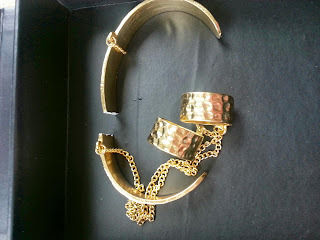 I'm kind of disappointed because I wanted to try one of these pieces that looks like a cuff with rings attached. I did email the company, so we'll see how they respond. 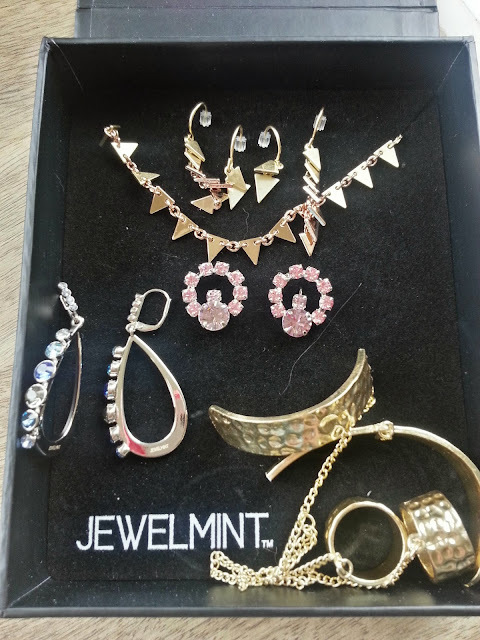 And here lies the caution you should take with Jewelmint - their monthly fee is $29.99, which goes into an account that you can spend on one basic item. They also have higher-priced lines that you can use your "credits" on by adding some of your own money. However, quite a few of their basic items are nowhere near worth $29.99. You have to be a "member" to shop on the site, and members get free shipping, but you can skip each month. So I always skip and then decide later if I want to buy something or not. So far I can't see the benefit of letting them take $29.99 out of my account and let it sit in their account until I decide what I want. 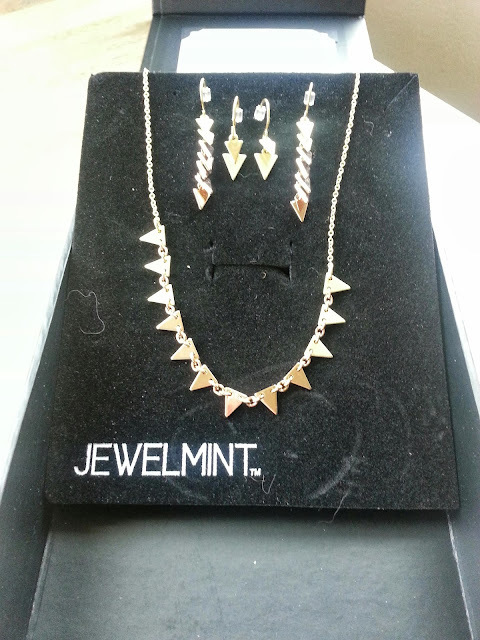 I do like Jewelmint. Although I question the $29.99 across-the-board pricing for their basic line, a lot of their pieces are really cute. They have surprise candles I really like - I actually love the candle as well as the stuff inside. I like their games and social side. By playing games, making comments and doing reviews, you can get social points that you can ultimately use toward discounts. And when others like or reply to your comments, you get points for that too. I just don't want them to hold on to my $29.99 each month when it doesn't seem like there is any benefit I get. I actually spent a lot of time on their site playing games and earning the social points before I ever bought anything, and they sent me lots of "half off your first item" coupon codes, so I finally used that to take the plunge.With other sub boxes, there is a benefit to subscribing- you usually get extras or higher value items than what you paid. I can't see that being the case with Jewelmint. So I would definitely recommend signing up, but then skipping and proceeding with caution when choosing your items. Anyway, I do like the non-broken stuff that was in my box. I think I got my $29.99 worth, especially if they will replace the broken item. I can see wearing it a lot, especially the triangle stuff. It's kind of trendy and still simple enough to work with lots of outfits. My fave items in the box. Cat hair added at my house. UPDATE: Jewelmint did respond to my request about the piece that broke when I tried to adjust it. They sent me a return label and another mystery piece, which was actually cuter! So I am happy.